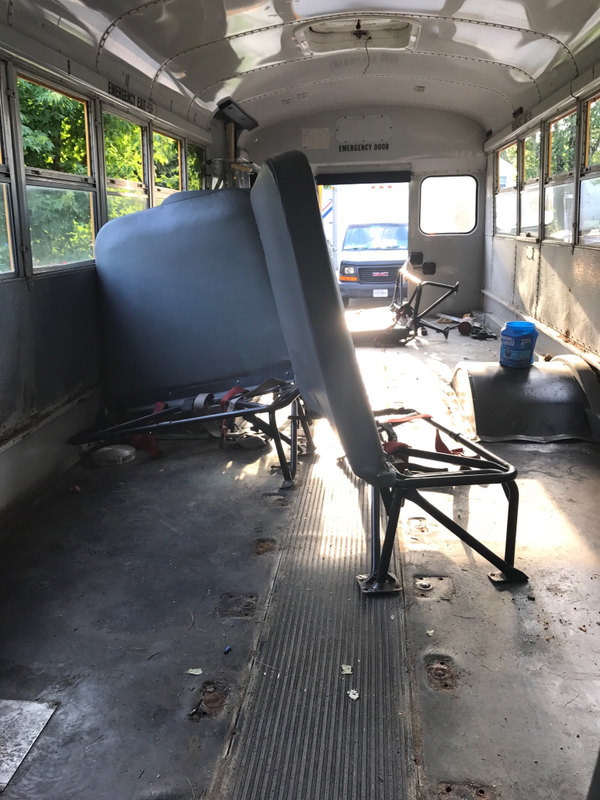 School Bus Conversion Resources - Out to my Ol' 55. Out to my Ol' 55. My wife and I purchased a 97' international 3800 with DT466e back in January. 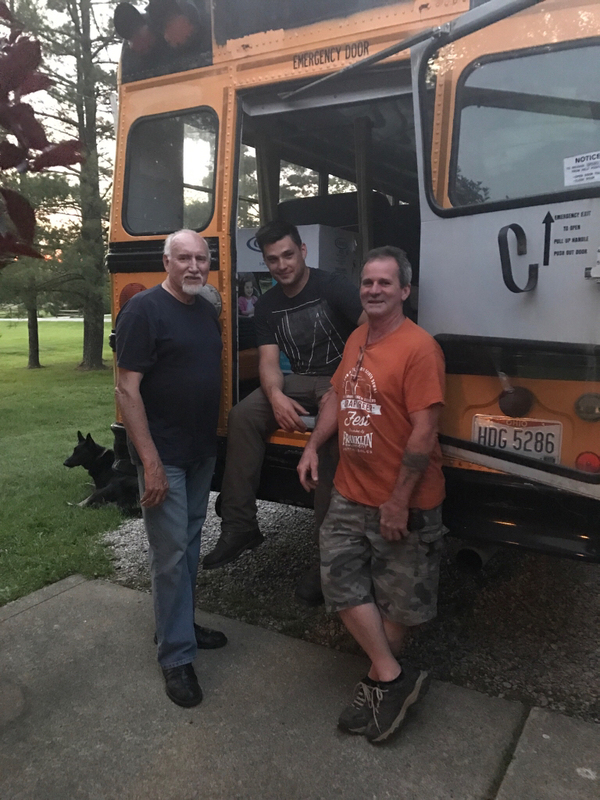 We live in Norfolk, Va. the bus was for sale in Albany Ohio on eBay for $1900. I put in a $1500 offer and it was accepted immediately. My Twin brother and stepfather went to pick it up for me with no issues. 1. Was not too long but not too short. I had not seen this bus at all until we went to Ohio for our baby shower, which was this past weekend. I was worried about getting it titled and insured to make the trip back to Norfolk. I have read through plenty of threads on the inspection criteria in Ohio. I went to the DMV and told them it was being converted to an RV. We asked if we could get the title changed to an RV now, to save us the headache later. She had no problem doing that for us. So now I have a yellow bus, full of seats titled and registered as a motorhome. My all state agent had a bus conversion option to insure the bus liability for $125 a year. I checked the fluid levels on the bus, and it made the 40 minute drive out to the in-laws no problem. The tires held air. So I am pretty sure we are ready to drive it home. I pressure washed the bus, and loaded up all the baby shower gifts into it the night before we left town. We gassed up the bus in the morning and left town. The bus is governed at 55 mph. We set two days for the 570 mile trip. Ol' 55 is the name we chose for the bus after the Tom Waits song of the same name. It seemed fitting for the first trip we'd take on the untested fighting machine. The bus made the trip fine. I could talk for a while as I am sure most of you can on the difference driving 55 mph in bus compared to 75 in a car. The bus did get hot a few times battling the mountains of West Virginia. I have done a little research on it and I will let you know what I find out. All other indications seemed perfectly normal the entire trip. I think we got lucky with this bus. The ceiling height seems very high. I am 5'11" and I must have 4" above my head in center. The air brakes are very cool after leaning about them. The idea that they fail safe is awesome. The diesel has 360k on the odometer but I didn't think it felt worn out. I wouldn't have anything to compare it to though. I look forward to communicating with you guys about your busses and ours. We will lay out our plans in our own build thread. be careful about getting that engine any hotter than where you had it... get it up to 220-230 and you risk ruining the cylinder liner seals and all your coolant ends up in your oil... its not hthe death of the engine.. would need rebuilt..
a DT-466 with 360K very well may have already been "in-framed" that engine has the ability to be rebuilt without removing it from the chassis.. as long as you dont toss a rod or such... its not a craxy job to do.. so even if it does get "tired" you can breathe new life into it! Thanks for the reply Christopher! I would have gotten to this sooner but work kept me out of town all last week. I don't really mind driving 55. I just want to drive as fast as I can with reasonable economy. We made it down on just over a tank and a quarter of diesel. Which was awesome because we could make it from Norfolk to Columbus with just a couple of jerry cans on the bus. You know? In case we couldn't stop for fuel. 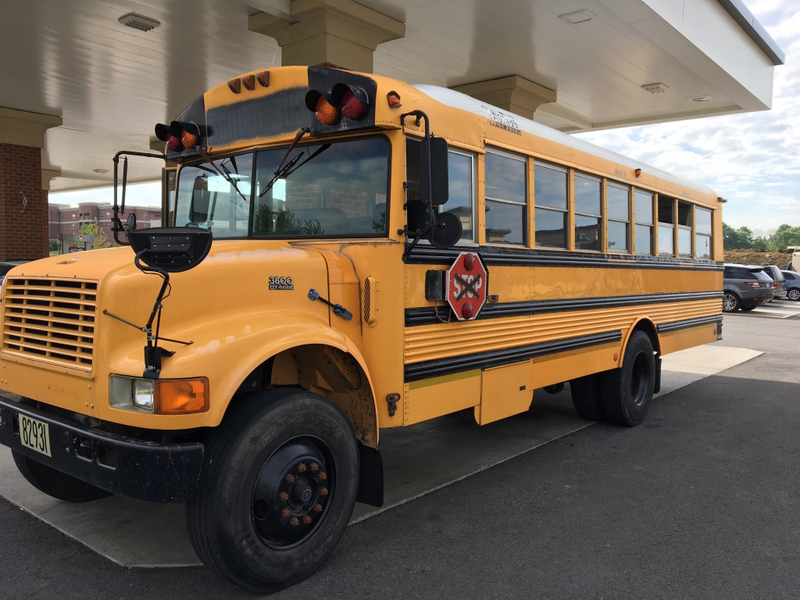 The bus was unloaded for the most part, so we will have to see how fuel economy changes once we start converting. I did read about failing clutches. There was also a big WHOOSH sound that I have read about when the fan engages. I never noticed any change in the noise coming from the engine/fan, so it may not have been engaging. I saw a few instances where the radiators were clogged with dust and dirt that would inhibit efficient cooling. I am going to dig around some more and see what I can find. I bought a couple of books on RV electrical systems that I am reading while I am not busy at work. I do know I want to learn about the bus, before I start tearing into it. I am going to try to find some wiring diagrams for my chassis this weekend. I want to be able to navigate the wiring when I start messing with the electrical system. I plan on getting the bus weighed empty this weekend so I can track the weight as the conversion progresses. I hope everyone has an enjoyable holiday weekend. I will start my own bus thread soon. That's a nice looking bus. Concerning finding a comprehensive schematic of the bus wiring system, yeeeeaaaaah. Most of us get a headache from that, but it does work out the hard way anyway. You've already put on some miles. That should always be first before spending on the build. Thanks for the reply, Robin! Yeah, I figured it would be wishful thinking on a wiring diagram for the bus. Worked has kept me off of here and out of the bus. I did go weigh it today, so I could compare it with how much weight I remove and add as the conversion takes place. It did have a small drill press and some bed frames that I intend on using to hold up my water tanks. I was also in the bus. I will get this on my conversion thread when I get started. We may be taking the seats and floor out this Sunday. I did have a question about the dt466. I noticed an open ended pipe sticking out passenger side of the transmission. It seemed to be exhaust? Anyone know what that is. Gosh I can't wait to learn all about this engine and bus. We're new to this all too and just bought a Thomas Built / International with similar specs to yours - am really interested in how folks with the similar buses lay theirs out differently and why, so very much looking forward to what you guys are doing. I've got some firm ideas of what I'd like and hoping we get to stick with that. We have some ideas also. My wife's are more in line with time houses. Mine resemble doomsday preppers. I think this bus was the right move. I had some really great help on Sunday afternoon taking the seats out. We only had to grind 7 bolts out. The rest came out willingly. I do see some rust around the fenders. 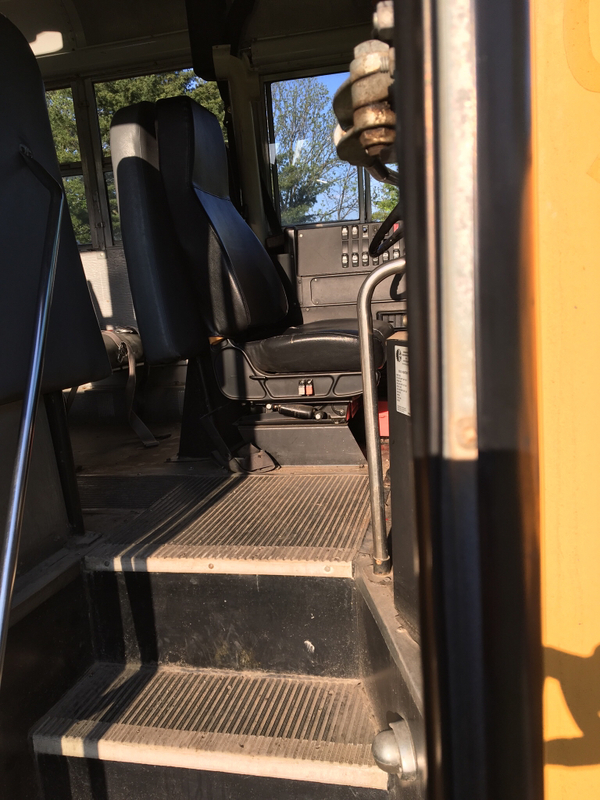 I am hoping to have a welder soon so I can weld up all of the small holes and weld in new panels to rid the bus of the rust in the floor. Saturday I plan on having some more help and we will tear out the rubber and rotten wood and take it to the dump. If you're lucky you can find a wiring diagram for your chassis, and then you're going to need another wiring diagram from the body maker. Where they combine is always a little fuzzy. You're making good time on the seats. You keep getting chunks of work done like that and you'll be done before you know it. It's interesting to see how much real estate you've got in there now that the seats are out, isn't it? I find it interesting that some people start with the floor while others start with the ceiling. Doomsday prepper ... in style! :rofl: Love it! Really, all I want is clean and aesthetically pleasing comfort with room for the dog, too. We're at waiting-to-do-the-next-step point. Need to get Thomas in for tires, a new tie rod, and inspection - then back to the body of him. Next year will be a total gutting, floor, ceiling, all of it at once - then spray foam insulation. Next year? You've still got time to get the insulation in before winter, then you can take some winter camping trips. Camping during bad weather is pretty interesting in a bus.